Hyundai Kona EV pricing will top out at $45,695 for the fully-loaded Ultimate. The mid-trim Limited starts at $42,195 while the base SEL carries the previously announced $37,495 sticker price. Those prices – particularly for the upper trims – sound steep for a small crossover-ish hatchback. But they reflect the Kona’s 258-mile range, its wealth of standard features and the fact that the EV qualifies for a federal income tax credit of up to $7,500, as well as for various state and local incentives. In California, where 2019 Hyundai Kona EV sales start as January ends, the state offers a $2,500 cash rebate (adjustable upward for lower-income buyers, although at these prices there won’t be many of those). Several local utility companies also offer EV incentives. 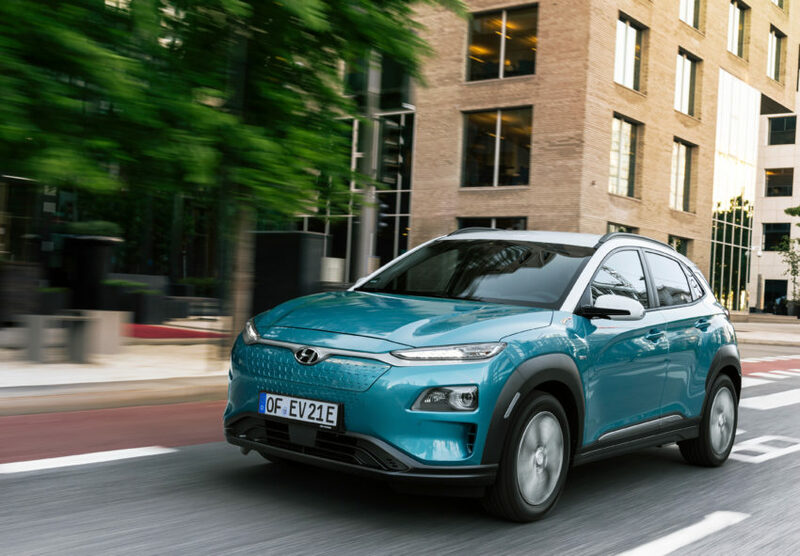 After the California rollout, Hyundai plans to expand Kona EV sales into what the company describes as “ZEV-focused states” in the west and northeast. While Hyundai can add whatever states it wants to the list, the 10 states that so far have adopted California’s zero emission vehicle mandate – and are considered the “ZEV” states – are California and Oregon on the west coast and Connecticut, Maine, Maryland, Massachusetts, New Jersey, New York, Rhode Island and Vermont in the northeast. All Hyundai Kona EVs come with a 201-horsepower, all electric, front-wheel-drive powertrain with 291 pound-feet of torque; a 64 kWh lithium-ion battery pack; an electronic single-speed transmission, and a nifty four-level regenerative braking system with a “hold-and-stop” feature that allows the driver to use a steering-well mounted paddle to bring the car to a compete stop without ever engaging the conventional brakes. In addition to 7.2 kiloWatt Level 2 charging, all Kona EVs get a fast-charge port for rapid battery recharging at commercial fast-charge stations using the SAE Combo system (also called CCS) that’s pretty much the standard for EVs in the U.S. – except for Teslas, the Nissan Leaf and the Mitsubishi Outlander PHEV. Other standard equipment across the lineup includes forward collision avoidance, blind-spot warning, rear cross-traffic avoidance and lane keeping assistance systems; Apple CarPlay and Android Auto compatibility; and a proximity key with push-button start. The base SEL gets active cruises control but not with full stop-and-go capability (that’s reserved for the Ultimate trim); 17-inch alloys; heated side mirrors, LED taillights and daytime running lights; automatic temperature control with a driver-only feature to reduce power use by warming or cooling only the driver’s side of the cockpit when there are no passengers; heated front seats; cloth upholstery; and an audio system with a 7-inch infotainment system touchscreen. The Limited trim adds a LED headlights; a power sunroof; leather seats; turn signal lamps in the side mirrors; power windows and a power driver’s seat; an auto-dimming rear view mirror with compass and HomeLink; wireless charging for smartphones and other compatible devices; and a premium Infinity audio system. The Hyundai Kona EV Ultimate trim adds a navigation system; a head-up display; cruise control with full stop-and-go function; heated and cooled front seats; heated steering wheel; rain-sensing wipers; rear parking sensors; and an 8-inch touchscreen display.